I’m a gamer and an aspiring game designer, it’s one of my passions. I love observing people playing games and figuring out the psychology behind mechanics and how they affect people. And when I need a break from the seriousness of life, I enjoy playing a board game. So from time to time I’m going highlight some of my favorite games on this blog. 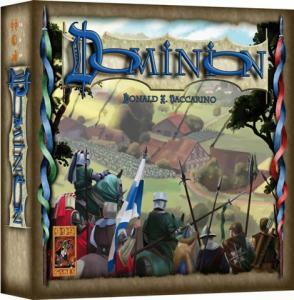 I thought I would start with one of the best deck building board games Dominion. For those who haven’t been following what’s going on in board games, here’s as quick as a primer as I can give. In the world of analog (board games) there are two types of games. Ameritrash and Eurogames. Ameritrash would be the games you grew up with such as Monopoly and Risk. These are mainly the type of games the player rolls dice, moves and resolves the text of the space they ended up on. Starting about twenty years ago the Eurogame started to come into dominance in the United States. Eurogames mainly center around strategy, and are less about luck. They are known for the use of victory points to determine winners. The other big difference is game length, Ameritrash tend to have an unlimited game time frame, where Eurogames tend to have more manageable game lengths. And now it’s time for DOMINION! 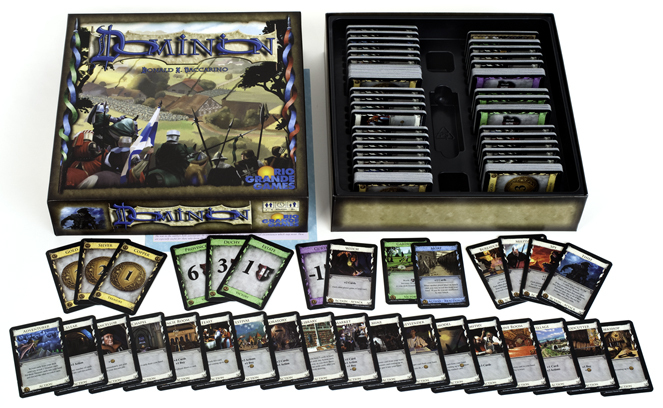 Dominion, since it’s release in 2008 was an instant hit with gamers. It was one of the first games to employ the mechanic (read: base ruleset) of Deck Building. Deck Building came from the ashes of the Collectible Card Game (CCG) craze. In a CCG the players would build a deck of cards by buying starter sets and then booster packs. Deck Building games instead give you all the cards and you build a deck of cards during game play. One of the best things about a game like Dominion is the fact that the base game offers a tremendous amount of variety between games, before any mention of the expansions needs mentioning. 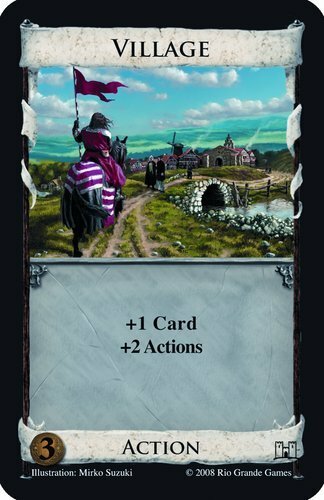 Dominion does have a number of expansions, none of which I will be talking about here. For the purpose of this article I am going to stick strictly to the base game set. Dominion is strictly a card game. The game consists of three types of cards. These are Treasure, Victory and Kingdom (Action) cards. The Treasure cards, three different types, are used in the game to buy other cards. The Victory cards, three different types, are used to determine the winner of the game. 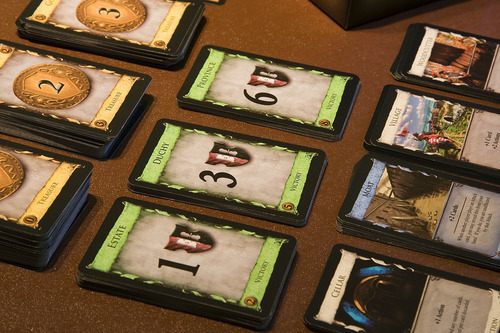 And finally Kingdom cards, 24 different types, are used to perform actions during the player’s turn. In setting up the game you will only play with 10 of the Kingdom cards. These cards are picked by random or by using the suggestions in the game manual. The goal of the game is to accumulate the most victory points by game’s end. To begin players are given 7 Copper Treasure cards and 3 Estate Victory cards. Players take their starting cards and shuffle them, they then deal five cards to themselves and place the remaining cards into a draw deck to their left. Players will have three areas in their play field in front of themselves. The first is the draw deck to the left, the center is their played cards and finally to the right is their discarded face up cards. An example of a Kingdom card. Players are allowed three phases on their turn. First they can play an action card, second they can buy cards and finally they will have a cleanup phase where they discard their hand and all played cards into their discard pile. During the action phase players can play a Kingdom card. These cards will allow you to do more then you can do on your turn. Normally you can play one action and buy one card, an action card might let your have one more buy or one more action for your turn. The key, and most fun aspect, to the game is the chaining together of these cards. The buy phase allows you to add cards to your deck. This is where the Deck Building mechanic comes into play. That ten card draw deck you start with will grow over the course of the game. Finally the cleanup phase is simply a discarding and drawing of a new hand of five cards for the next round. The game ends when either: A) You run out of Province Estate cards or B) Three different Kingdom card supply piles run out. Not only do you have to strategize which Kingdom cards to buy, watching the piles of cards is another key strategy to winning the game. In the two years since obtaining Dominion the base game alone is still a fresh and fun game to pull out. I believe what makes the game so much fun is the fact that it is quick to learn and hard to master. There is a certain amount of randomness in the building of the draw deck, but you still have control over what you buy and how you build that deck. There are drawbacks to the game. Some have complained the game does not have enough player interaction. The base set tries to deal with this with the Witch Kingdom card. This card will give curses to your opponents which causes them a -1 victory point. They also included another attack card, that causes other players to lose cards in their hand. But it still doesn’t pull the game away from being a solitaire game. Even with the few negatives the game has, I have found Dominion to be a great family game to put on the table for game night. I am finding myself more a fan of the games that put strategy over war as a center piece to games, and this is one of the best games of the modern board game era. And that doesn’t even count in the expansions that only add more variations and cards to the mix. I must add that Dominion is a two to four player game, and works great as a couples game. There is an expansion that allows for six players, but I can’t see why combining two base sets couldn’t add additional players in of itself. All in all a great game I recommend to anyone who loves games. If you are looking to pick up the game I recommend Thought Hammer (and no I’m not getting commission.) Or you can peruse Google Shopping.